16926-SD-DST is rated 4.2 out of 5 by 118. Rated 5 out of 5 by Miss Scarlett from Perfect Size So many faucets today are big and bulky but the Delta Lewiston fit great in my low rise space. Though it was put in by a professional in 10 minutes he had it in and working! Rated 4 out of 5 by Chris from Great features I bought this a few weeks ago. Love it but have to make sure to turn faucet off correctly so it doesn't drip! Rated 5 out of 5 by jim47 from Installed myself. Went well. I have installed the faucet along with a new sink. It when very well. The only hang up was I had a problem with the Spray hose disconnecting when I turned the water on. I call support and found out that I had used the wrong clip from the supplies. It was a blue clip the support staff said. I changed to the blue clip and it was fixed. It has been a great new change to our kitchen. Rated 5 out of 5 by kylechad from Looks great! Works fantastic! Happy Dance!! Brought this faucet to go with our new kitchen counter and sink. 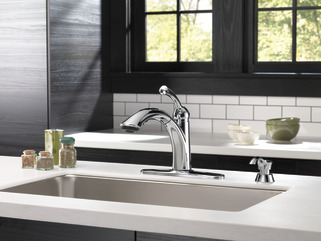 Absolutely love this faucet! It works so well and looks great! Love that it doesn’t sit as high as some of those other designs because it looks classy and doesn’t get in the way. The spray of water coming out is perfect, not so hard that it splatters everywhere. The soap dispenser is easy to fill and gives just the right amount of soap each time. Love that the set doesn’t scratch too!! A winner all around that makes me do a happy dance!! Thanks Delta for a great product!! 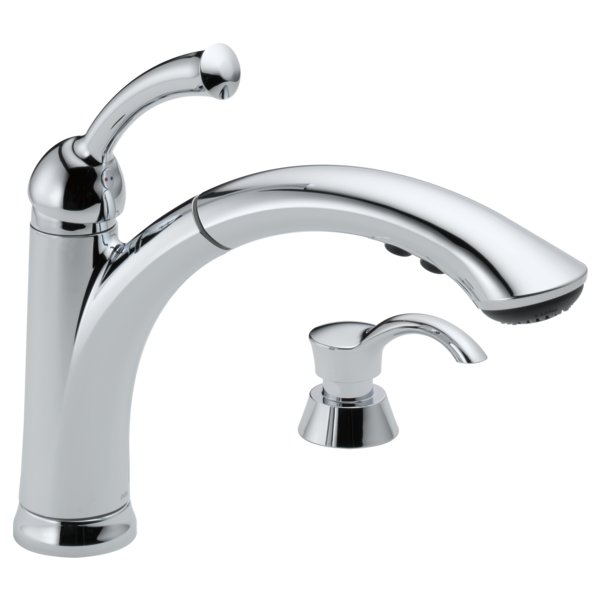 Rated 5 out of 5 by TBDG from Nice kitchen faucet and dispenser I like it except sometimes when the water has been completely turned off after usage it tends to do a few drips; do not care for that; like the under-side spray buttons and like the spray which can be hard or very light. Very much like the warranty! 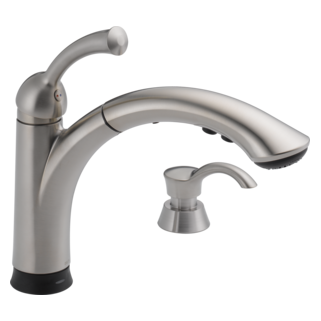 Rated 1 out of 5 by glenonroad from Not happy My wife and I bought this faucet 4 years ago from Lowes and besides a leak we had a plumber fix a few years ago there is an issue getting the faucet to turn off and not drip. One has to turn it on and off a few times and then hit the sweet spot just right for it to shut off properly. Rated 4 out of 5 by Richard from Good I’ve only had this for just over a week. I was pleasantly pleased with the ease to install. I’m a little concerned about the water lines being plastic instead of metal. Please I need a manual fro this product . I have received from you the valve RP50587 AND i NEED INSTRUCTIONS TO REPLACE it Thanks!!!! Is the sprayer portion plastic? My initial attempt to resolve this problem by cleaning the hub lasted about 3 or 4 days. Per the Delta techs initial instructions, I replaced the O-ring and more than a month later there hasn't been any squeaking. Our faucet is 1 year old. Water now drips out of the faucet when in the down/center position. To turn the water off completely, we slide it up to the right. Do I need to replace the O-ring seal RP44648 to stop the leak? Where do I buy it? How do I take apart the wand assembly to clean the aerator? Is the soap dispensed within the faucet-water or seperately off to the side? How does one get the soap onto the dishes? Thank you. Soap dispenser is a separate unit that installs in a different sink hole. It is a pump style like you might find in commercial bathrooms. how do i change the aerator in lewiston collection kitchen faucet? Thank you for your question. 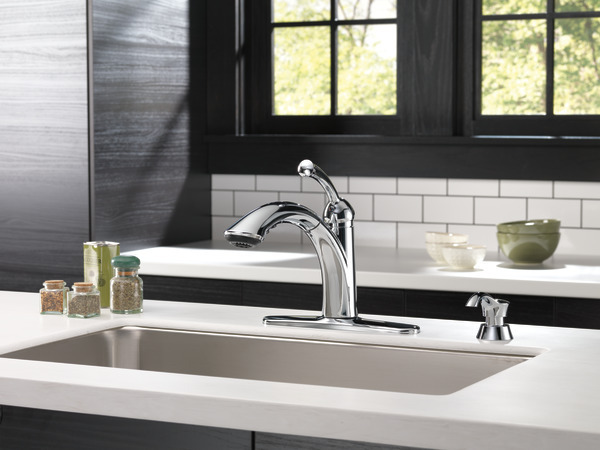 Delta Faucet model # 16926-SD-DST does not have an aerator that can be removed. If it needs to be replaced, then the wand will need to be replaced with Delta Faucet part # RP60931.